Street creep naturally occurs as the concrete in roads and driveways expands and contracts due to seasonal temperature changes. Concrete that's been cast in place, whether to construct buildings, bridges, or pavements, will expand when heated and contract when cooled. When building contractors and design engineers build with concrete, they can create expansion joints and control joints that make allowances for this. Because concrete contracts (shrinks) in the cold, this is the time when the expansion joints between the concrete slabs are at their widest. During this time, these gaps can become filled with sand, gravel, and other debris. During the summer, when this concrete begins to expand, the expansion joints may be compromised. If there is too much debris inside of the expansion joint at this time, or the concrete has not been properly maintained, it will begin to push against the adjacent concrete slab (i.e. your driveway) with increasing force. Over the course of several years, this can move your concrete driveway slab rearwards by several inches. 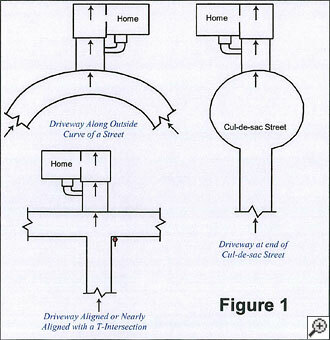 Where is the concrete driveway moving? Into your concrete garage slab. As this happens, the garage slab will also move, beginning to push against your basement wall or rear foundation wall. The end result of this chain reaction? Wall deflection, cracking, and a damaged foundation. Street creep can lead to serious problems in a home, including potentially serious foundation problems. Properly maintained and installed control joints are a simple solution. For Bowing or Damaged Foundation Walls: For homes that are experiencing damage to the foundation walls, installing a foundation wall anchor system will stabilize the leaning or bowing foundation walls. Foundation wall anchors will effectively stop any further movement of the walls while stabilizing them and restoring structural strength. To Prevent Street Creep Issues: Wall anchors alone will not be able to fully address street creep issues. In addition to this, proper expansion joints should be installed. 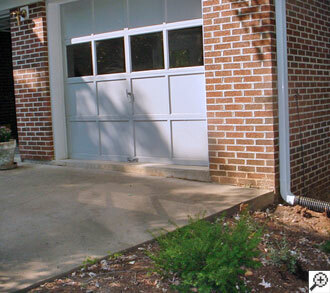 We recommend two expansion joints in the driveway to allow for proper seasonal concrete expansion and contraction. We offer free foundation repair quotes for street creep damage as well as foundation issues of all types. If you live in the IA, IL and MO area, including Clark and Lewis counties, as well as Hancock, Adams, and McDonough counties or anywhere nearby, call or e-mail Foundation Supportworks of the Tri States today to schedule an appointment! We provide street creep repair in Peoria, Quincy, Pekin, Galesburg, Burlington, Ottumwa, East Peoria, Hannibal, Macomb, Canton, Oskaloosa, Fort Madison, Keokuk, Fairfield, Mount Pleasant, Monmouth, Washington, and the surrounding areas in Iowa, Illinois, and Missouri.